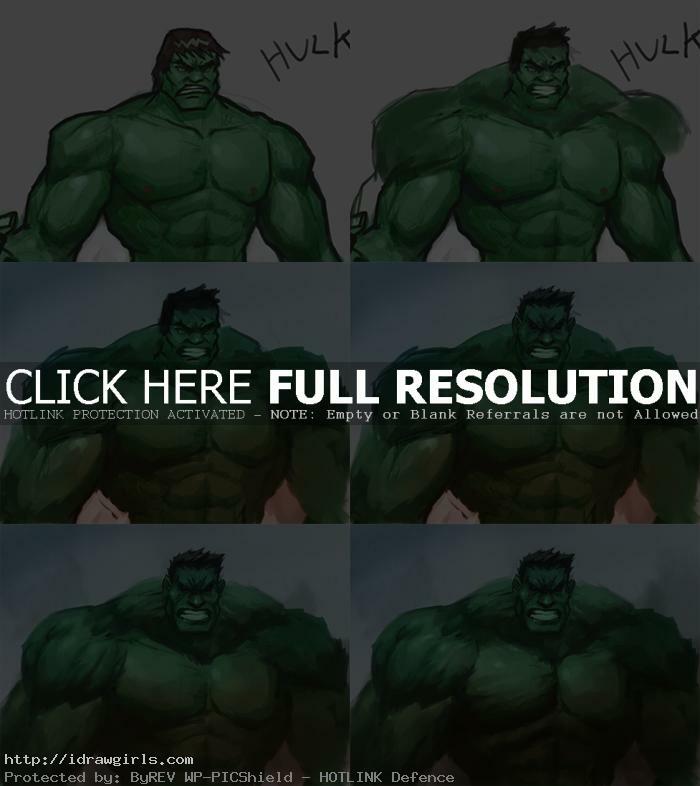 Digital painting tutorial Hulk. Learn how to paint and color Hulk from video and step by step tutorial. This tutorial, I am just sketching (painting) over the older version of Hulk I did a long while back *see How to draw Hulk. I just thought I will fix him up a bit since I only spend about half hour drawing then painting the old Hulk. I basically use the same color palette as the previous version. The different is in the style and attitude. In this new version, I make him meaner and more beast like. I give his face a little more style and depth. If you look at the step by step, I basically change everything. I was thinking I should have just make new one. But a lot of time, paint over your old work help improve your skill as an artist. I painted over many of my older color sketches and I think the newer version is always better. I spend about the same amount of time painting this new one as I did with the older version. The Hulk possesses an incredible level of superhuman physical ability. His capacity for physical strength is potentially limitless due to the fact that the Hulk’s strength increases proportionally with his level of great emotional stress, anger in particular. The Hulk uses his superhumanly strong leg muscles to leap great distances. The Hulk can slam his hands together creating a shock wave, this shock wave can deafen people, send objects flying and extinguish fires. The Hulk has shown a high resistance to physical damage nearly regardless of the cause, and has also shown resistance to extreme temperatures, mind control, nuclear explosions, poisons, and all diseases. In addition to the regeneration of limbs. Here is a quick digital painting of the Hulk. 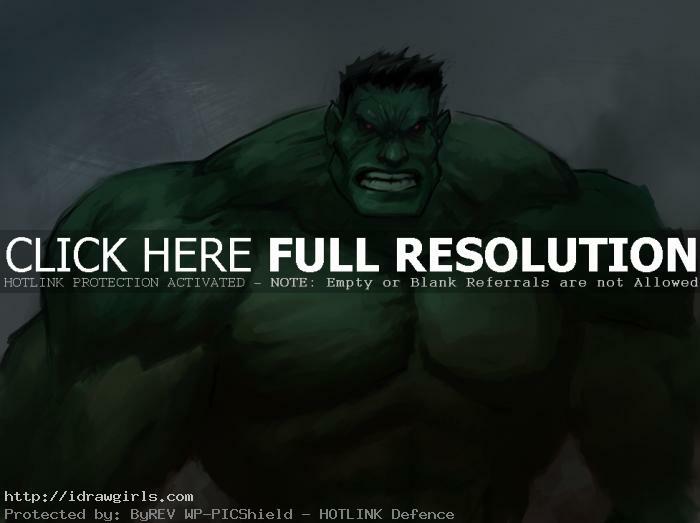 Watch the digital painting video tutorial how to paint the Hulk. Nice works, Are you giving online classes for Comic drawings and anatomy studies ? Please let me know. Awesome! Your art is very inspiring! I hope to achieve this level of greatness in my own art.